Detail of illustration by Venezuelan artist Eduardo Sanabria. Taken from his pubilc Facebook profile and used with permission. As the uncertainty around Venezuela’s political situation continues, local and international human rights groups are reporting intermittent blocks to different social medial platforms — including Twitter and Instagram — as well as instances of media censorship. Reports indicate that the blocks started on January 21 and intensified from January 23, 2019, when Juan Guaidó, president of Venezuela’s National Assembly, invoked articles from the country’s 1999 constitution to take presidential powers away from Nicolás Maduro, who has been in office since 2013. Anti-Maduro protests escalated dramatically in the capital, Caracas, as well as in several other parts of the country. Venezuelans are now on the edge of their seats as an important section of the Latin American community and several key international players — including the United States — expressed their support for Guaidó as interim president of Venezuela. The regional countries that do not share this stance are Mexico, Uruguay, Bolivia and Cuba. Internationally, China and Russia have expressed their support for Maduro. This long and painful struggle for power in Venezuela, which has cast the majority of the population into dire economic straits, now appears to be at the mercy of both internal negotiations and international pressures. Meanwhile, controls over information and communication, measures that have been growing stronger in recent years, are becoming more aggressive by the day. According to Guaidó, he was forced to cancel a number of TV and radio interviews, as the the National Commission of Telecommunications (Conatel) forbade the media to utter his name. Local organization Internet Sin Filtro has been collecting reports and running tests, as well as sharing information on how to circumvent the blocks. They have reported on intermittent obstructions to different social media spaces — like Instagram and Twitter — since January 21, in various parts of the country. The block uses SNI filtering, similar to recent @wikipedia block https://t.co/t2qVS4zxLm. IT seems the block has been lifted, but recent blocks have also worked intermittently. Carlos Guerra from Derechos Digitales shared an analysis of how such technical strategies control information and communication through the internet in increasingly more intricate ways. According to Guerra, not only are the blocking strategies more complex and sophisticated, they are also more difficult to overcome. We now have information on the block against Instagram in Venezuela. Maduro and Conatel [the National Commission of Telecommunications] are chasing Instagram Live broadcasts that have allowed Guaidó to reach the hundreds of thousands of people he has very fast, and with a bigger audience than most TV (censored) channels. It is important to emphasize that the blocks are taking place not simply amid the political crisis, but also in the context of grave concern over a proposed cybersecurity bill that would, according to a report by Access Now, “put the digital rights of Venezuelans — and the entire internet in the country — in jeopardy”. This new legislative tool, in which the powers of the Executive branch to surveil over the internet becomes bigger and more expansive, could become a new control implement that would join the public policies that have been taking place over a decade to restrict information flux and freedom of speech online. Reports coming from independent online media outlets note how radio stations around the country and Chilean news channel “Noticias 24 horas” (24 hour news) have either been taken off air, or told to avoid reporting on protests or referring Juan Guaidó as interim president. #SNTPAlert Military Counterintelligence agents in Maracaibo took over the headquarters of GlobalTV and took the regional channel’s signal off the air for transmitting Juan Guaidó’s speech. This was declared by the chief of the commission, who showed up [at Global TV’s headquarters] with 15 squad cars. #SNTPAlert Nicolás Maduro is threatening to remove permits to radio stations. This January 24, César Miguel Rondón was censored on his radio show, Circuito Exitos, denying him the opportunity to comment on the events of January 23, which made news around the world. While protests were in their most intense hour, on Globovisión they were discussing theater plays at 11:30 am. 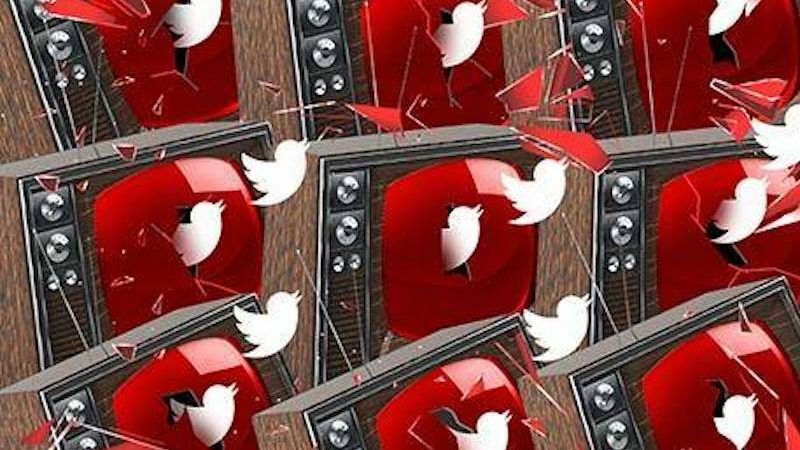 At the same time, [TV channels] Televen and Venevisión were not showing any of what was going on in Venezuela on January 23 on their YouTube channels. These blocks and information controls are taking place in an already limited media ecology, forcing Venezuelans to depend on the internet and independent media outlets to access crucial information. As the international community picks sides and tensions escalate, more controls over both traditional and online media are expected to take place.